Online marketers and web designers understand that sometimes a client will randomly have a craving to go in and change content on a site. This sounds great until they add 17 H1 title tags, bold every other word or simply make everything look like sparkling fun rainbows! I mean don’t get me wrong, I really enjoy rainbows, but sometimes even they’re too vibrant and the video below sums everything up! So, how can I disable the Text editor for a User In WordPress? After a few times of this happening I now use two plugins to stop all of this from happening! First install TinyMCE Advanced and then the Adminimize plugins. Open your TinyMCE Advanced settings and set the fields you wish your user to be able to use. Less options seem to work much better or they may try to add in some more flare! Optional – Copy your websites theme’s styles into the drop down menu, by adding them into your editor-style.css (May need to create this). We tend to skip this step because we hard code the styles into our themes directly and they format automatically. After this is done, take that user and make them an Editor. By doing this you are stopping 85% of the destruction they maybe able to cause! Time for the fun! Open up Adminimize and check mark away at all of the stuff you do not want that user to mess with. Hide WordPress Yoast Plugin From Users and More! Now if you have been hired as an online marketer, you may want to blog a WordPress User from accessing your Yoast Plugin. You can even other elements in the TinyMCE such as the Title H1 tags and anything else in the dropdowns. To achieve this, use FireFox or Chrome and right-click and inspect the element you want to hide on the page. 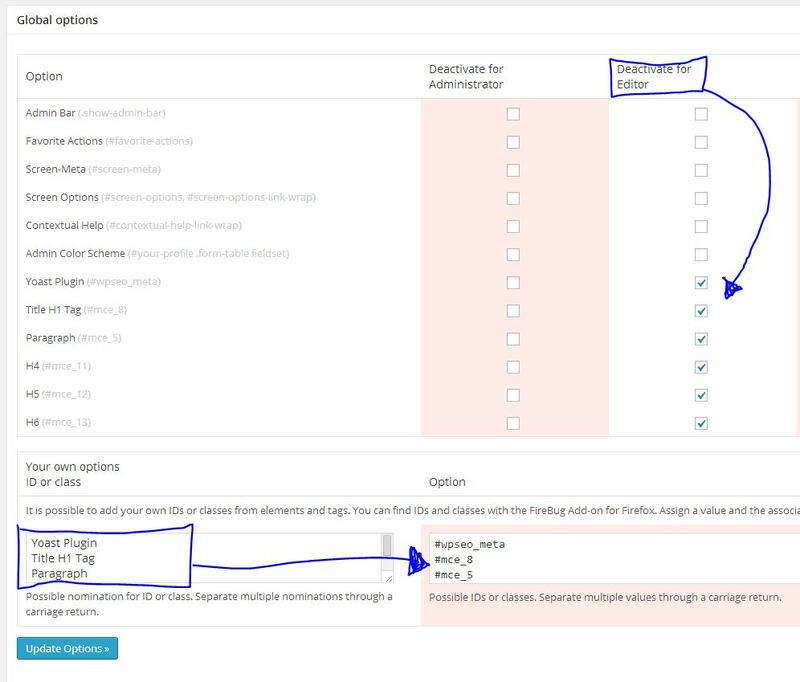 Finds its ID as we have and use the image below as a guide to disable the Yoast Plugin from a user. Did this help your situation out or do you have a better solution? Please let us know by commenting below!